*Note: Instead of some of the water, you can substitute it with regular or evaporated milk to give it a thicker consistency. Dissolve the masa or masa harina in 1 quarter of water. if you’re using masa, you’ll need to work it through your fingers in the water to get rid of any lumps. Pour through a strainer into a large heavy-bottomed pot set over medium-high heat. Add the cinnamon sticks, piloncillo cones, and the other 3 quarts of water. Stir often with a large wooden spoon while bringing to a boil. 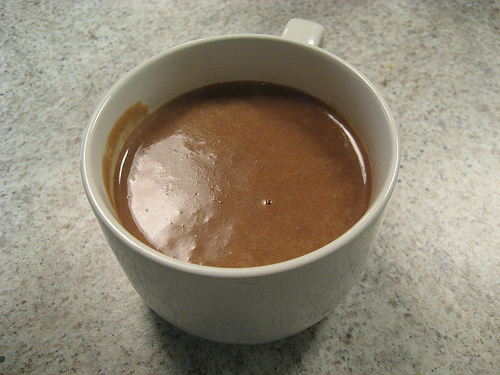 reduce heat to a low and add the Abuelita, Nesquick, and Cal-C-Tose chocolates. 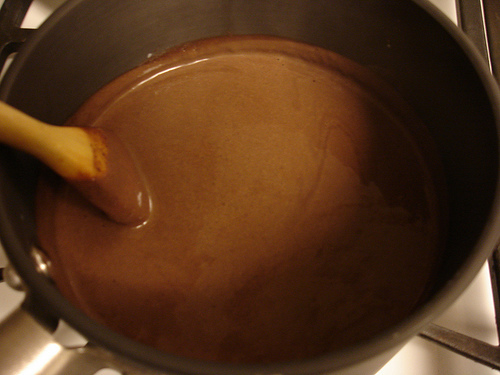 Continue stirring to dissolve the piloncillo and chocolate. Continue to cook until thickened. Remove the cinnamons sticks. Serve with tamales or sweet bread. This entry is filed under Traditional Beverages. You can follow any responses to this entry through the RSS 2.0 feed. You can skip to the end and leave a response. Pinging is currently not allowed.